You are currently browsing articles tagged LGBT+. Please note that this programme will be updated as necessary. ***The event is organised by Katherine Harloe (k.c.harloe at reading.ac.uk), Talitha Kearey (tezk2 at cam.ac.uk), and Irene Salvo (isalvo at uni-goettingen.de).If you would like to attend this event, registration is now open on Eventbrite. You will need to register both for the workshop and the keynote. You can attend either or both of them but they are separate tickets – workshop registration is here and keynote registration is here. Members of the WCC UK are entitled to complimentary tickets and have been sent instructions on how to order them; if you need a reminder, please e-mail us at womensclassicalcommittee at gmail dot com. The WCC is committed to providing friendly and accessible environments for its events, so please do get in touch if you have any access, dietary, or childcare enquiries. The Women’s Classical Committee is committed to making our events as inclusive as possible, and recognises that the financial and practical challenges of childcare often impede people from participating in workshops and conferences. Anyone who needs to bring a dependent child or children with them in order to participate in one of our events is usually welcome to do so, but we ask you to inform of us this in advance so that we can take them into account in our event planning and risk assessment. The safety and well-being of any children brought to our events remain at all times the responsibility of the parent or carer. While we do our best to ensure that rest and changing facilities are available for those who may need them, this will depend on the individual venue we are using. Again, please contact us in advance to discuss your needs, and we will do our best to accommodate them. 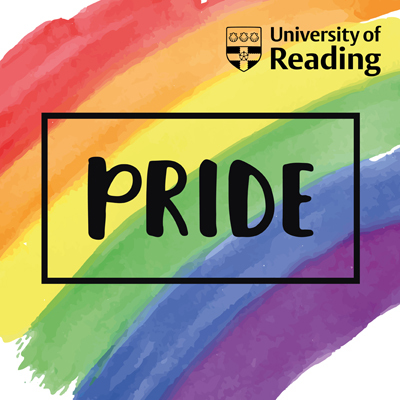 The event LGBT+ Classics is generously supported by the Department of Classics, University of Reading and by the Collaborative Research Centre 1136 Education and Religion at the University of Goettingen. The Women’s Classical Committee UK is organising a one-day workshop on Classics and Queer studies to highlight current projects and activities that embrace the intersections of research, teaching, public engagement, and activism. The day will bring together academics in Classics (and related fields), LGBT+ activists, museum curators and those working in other areas of outreach and public engagement. We will explore how LGBT+ themes are included in Classics curricula; how public engagement with queer Classics and history of sexualities can contribute to fight homophobia and transphobia; and the ways in which the boundaries between research, teaching, and activism can be crossed. We will also discuss strategies of support for LGBT+ students and staff, current policies in Higher Education, and what still needs to be improved. We hope to create an atmosphere of sharing experiences, knowledge, and ideas among all the participants to further queering our discipline. 15.00 – Nicki Ward (Birmingham): Sharing Good Practice: A Model for Embedding LGBTQ Inclusivity in the Curriculum. 16.05 – Round table on policies and support strategies with Clara Barker (Oxford), Simon Chandler-Wilde (Reading), Alyssa Henley (SupportU), Alan Greaves (Liverpool) and Jessica Moody (ECU). Please note that this programme will be updated as necessary. The event is organised by Katherine Harloe (k.c.harloe at reading.ac.uk), Talitha Kearey (tezk2 at cam.ac.uk), and Irene Salvo (isalvo at uni-goettingen.de). Attendance is free for WCC UK members, £10 for non-members (to cover catering costs). You can join the WCC UK here (and if you’re a student, underemployed, or unemployed, membership is only £5). Travel bursaries will be available for students and the un/under-employed. If you would like to attend this event, registration is now open on Eventbrite. You will need to register both for the workshop and the keynote. You can attend either or both of them but they are separate tickets – workshop registration is here and keynote registration is here. Members of the WCC UK are entitled to complimentary tickets and have been sent instructions on how to order them; if you need a reminder, please e-mail us at womensclassicalcommittee at gmail dot com. 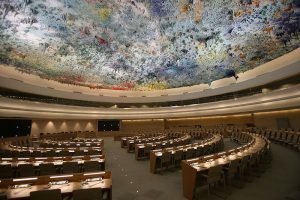 Vitit Muntarbhorn, the UN’s first Independent Expert on protection against violence and discrimination based on sexual orientation and gender identity, has resigned after a just year in his post, citing ill health and caring responsibilities. Before stepping down, he will deliver his second and final report. 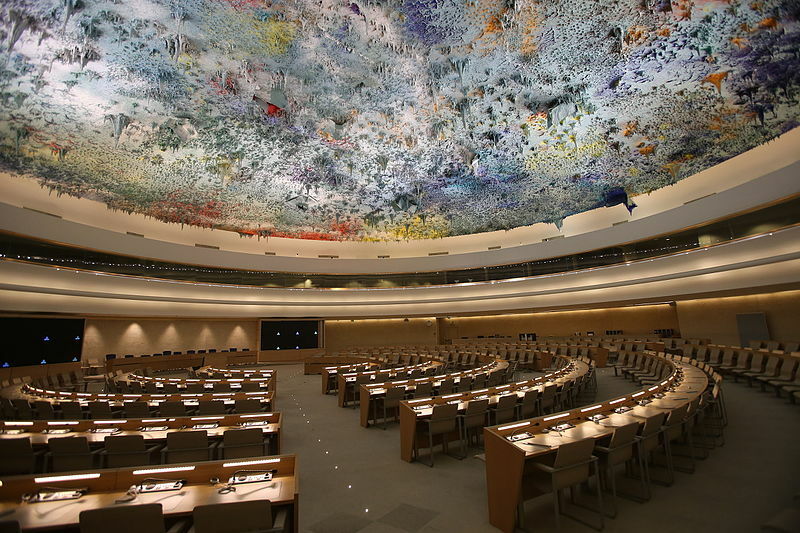 This is just the latest development in a long-running UN battle over LGBT rights – and it could herald a new attempt to undermine international efforts to protect and promote the fundamental human rights of LGBT individuals. An appeal for personal stories from members of the LGBT+ community has been issued as part of a project marking 60 years since the publication of a milestone report in the unfinished path towards equality. Monday September 4 marks the 60th anniversary of the publication of the Wolfenden Report, which resulted 10 years later in 1967 in the partial decriminalisation of homosexuality in England and Wales. The report was named after former University of Reading Vice Chancellor Sir John (later Lord) Wolfenden, who chaired the ‘Report of the Departmental Committee on Homosexual Offences and Prostitution’. He was Vice-Chancellor at the University of Reading from 1950 to 1964. Now, the University and local LGBT+ charity Support U are seeking to mark the anniversary by collecting stories and recollections from those who have witnessed discrimination first-hand, but also felt the positive difference changes to the law over the past 50 years have made to their lives. Monday’s anniversary comes two days after Reading Pride, and Support U’s partnership with Reading Buses means many will have seen Lord Wolfenden pictured on the side of buses over the weekend. While ‘pride’ was not an item on Wolfenden’s agenda, indeed his view was that gay people should not be visible, without events like Wolfenden’s Report the LGBT+ community would not have had a voice; they would still have been persecuted into the shadows. 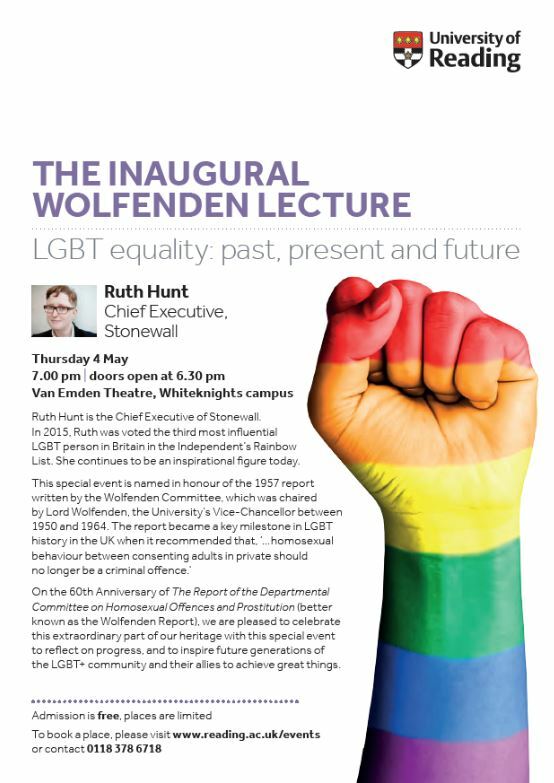 We are delighted to welcome guest speaker Ruth Hunt, Chief Executive, Stonewall to the University of Reading to deliver our inaugural Wolfenden Lecture. Ruth will be discussing ‘LGBT Equality: Past, Present and Future’. Ruth Hunt is the Chief Executive of Stonewall. In 2015, Ruth was voted the third most influential LGBT person in Britain in the Independent’s Rainbow List. She continues to be an inspirational figure today. On the 60th Anniversary of The Report of the Departmental Committee on Homosexual Offences and Prostitution (better known as the Wolfenden Report), we are pleased to celebrate this extraordinary part of our heritage with this special event to reflect on progress, and inspire future generations of the LGBT+ community and their allies to achieve great things. Admission free. Booking essential. Please click here to register. We look forward to welcoming you at what promises to be an interesting event. n 1957, the Report of the Committee on Homosexual Offences and Prostitution chaired by Lord Wolfenden, Vice-Chancellor of the University of Reading, recommended the decriminalization of consensual homosexual behaviour between men over the age of 21. Although the recommendations were not implemented for a further decade, this was a partial but significant step on path towards equal rights and freedom for LGBT+ people. As part of the afternoon programme, the seminar will be followed by a wine reception. Spaces are limited for the seminar, and booking is essential. To book a place, please visit the events page or call 0118 378 6718.